What’s the problem with landfills? The RE Store was founded with the goal of reducing the amount of useable building materials that end up in landfills. We believed then, as we do now that waste is not a tangible item, but a action that we perform. As humans living in an material society, it can be easy to see unwanted items as something without value. Here at The RE Store we want to change that. We try and help our community see the value in unwanted items, whether it’s through creative reuse, resale, or recycling. Since 1993, our community has donated nearly 50 million pounds of building materials to The RE Store. If you combined all of the lumber, doors, lighting, windows, and more that you’ve saved, we could construct nearly 600 homes, roughly half the size of the York Neighborhood here in Bellingham. Imagine what that would look like if all of that material was in the landfill! Scary, right? But in many cases that’s exactly what happens. Today landfills around the world are made up of 60% construction and waste debris, so it’s no wonder that the Fresh Kills landfill of New York, New York was once ranked as the single largest man-made structure in the world. Here in Whatcom County, the materials that we throw away end up in landfills along the Columbia River in Washington and Oregon. Out of site, out of mind, right? Not quite. 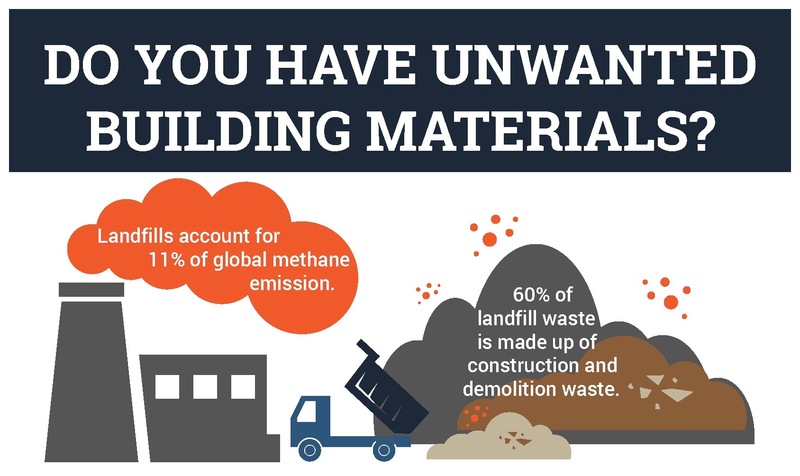 Each year, landfills are the third largest source of methane production around the world, accounting for 11% of all methane worldwide. With methane being a major cause of global warming, landfills are a big deal. These numbers are scary, and it can be easy to think that the problem is out of our hands. But it’s easy to take action. Next time you have unwanted building materials, consider donating them to The RE Store instead of throwing them away. If you’re not sure what we take, be sure to visit our donation page. Things like cabinet sets, flooring, PVC, and toilets are on the list – and that’s just the beginning. If your items are still attached to your home or building, contact our salvage crew. They’ve got the tools and know-how, to strip-out or tear-down your unwanted furnishings and structures. Don’t have anything to donate right now? Share this post, and our donation page with three friends that don’t yet know about us. While we want to keep as much as we can out of the landfill, some items cannot be reused or resold. But chances are, they can be recycled. If you have a donation that we can’t accept, check out this list of recycling resources in Whatcom County for information on other organizations that may take your items. 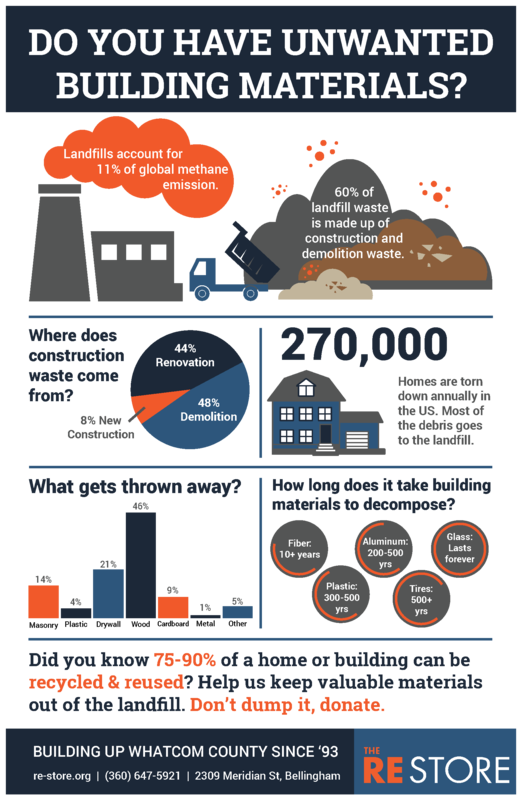 Check out the infographic below to see just how important it is to keep building materials out of the landfill. And be sure to share with a friend.